First and foremost, get a flu shot. Flu shots don’t protect you against everything, but they are the best and easiest way to prevent the strains that are spreading like wildfire. During lunch, go to a nearby pharmacy and arm yourself with the most effective weapon. Daily vitamins fill in the holes of your nutrition and are great for bolstering your overall health. But what do you do if you get that dreaded scratch in your throat? Vitamin C to the rescue! Taking vitamin C with your daily vitamin can give your immune system that extra boost to help you stay strong this flu season. Even if you get sick, taking vitamin C products can help shorten the length of your illness. Make a habit out of running a sanitizing wipe across your desk and office equipment, with special emphasis on one of flu season’s biggest culprits, your phone’s mouthpiece. If you have spare time, consider doing yourself and coworkers an extra favor by using your sanitizing wipes in common areas frequently, too. Also keep hand sanitizer on your desk, and use it regularly. You’d be surprised at how many germs flourish in your personal work space and common areas! Eating right and getting enough sleep can do wonders! Fruits and veggies are a haven for healthy vitamins, but nothing fights illness quite like a full eight hours of sleep. If you feel a bug coming on, getting to bed earlier can be a great way to fight it. If you do both, your health in general will greatly improve. Flu season is here, but if you keep our advice in mind, it won’t derail you from your fall fun! 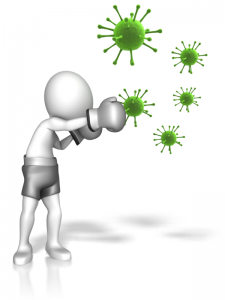 This entry was posted in Clients, Currently Employed and tagged fight office germs, Flu season at work, stay healthy at work, surviving flu season. Bookmark the permalink.